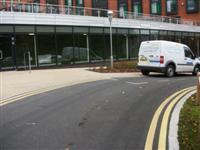 Services / facilities within the building include catered student accommodation and conference accommodation, the main reception, common room and a meeting room. Services / facilities within the grounds include a Sensory Garden. Related link Charles Morris Hall Dobree House. Related link Charles Morris Hall Whetton House. 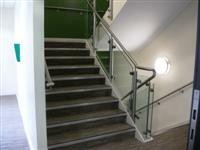 The reception and common room are also used by residents of Dobree and Whetton Houses. The car park is at the rear of the East Block. 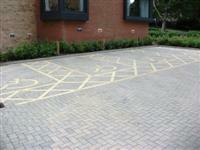 The dimensions of the Blue Badge parking bay(s) are 400cm x 600cm (13ft 1in x 19ft 8in). The nearest Blue Badge bay is 22m (24yd 2in) from the reception rear entrance. The furthest Blue Badge bay is 28m (30yd 1ft) from the reception rear entrance. There is an area outside the Level 2 Link entrance which can be used as a drop off point, shown in photograph 2. This information is for the entrance located off the main courtyard, leading into East Block. 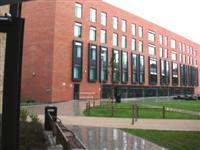 This is the main reception for all 3 Charles Morris Halls. 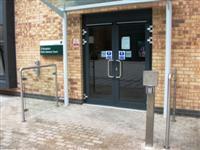 You are on Outside Access (Reception Rear Entrance). Skip to the next section. This information is for the entrance located at the rear of East Block. 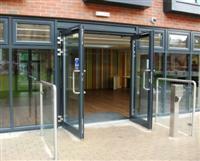 The automatic doors require a key fob to operate and open towards you. 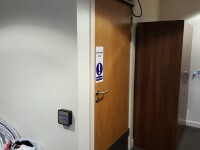 This entrance gives access to level 2 of the East Block, and is used to access reception from Dobree and Whetton Houses (located opposite this entrance). The reception is located on level 3 and can be accessed via the East Block main lift. There is also an entrance to the far left of the building from this entrance, down the ramp, which gives access to level 1. This only has a single door, 101cm wide. You are on Outside Access (West 3 Entrance). Skip to the next section. This information is for the entrance located in the corner of the courtyard. 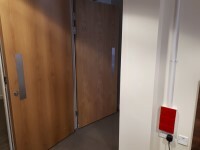 The automatic door requires a key fob to operate, and opens towards you. This entrance gives access to level 3 of the West Block. West 1 entrance, located in the other corner of the courtyard, is identical to this. West 2 entrance, located between these 2 entrances, is similar but does not have an automatic door. You are on Outside Access (Level 2 Link Entrance). Skip to the next section. This information is for the entrance located off Mount Preston Street. This entrance gives access to the link between the East and West Blocks on level 2. All other levels are accessible via the lifts from this entrance. 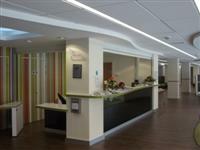 Photograph 1 shows part of the common room, which is located in the main foyer, to the right of reception as you enter from the main entrance. 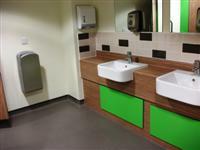 It contains a TV and seating area, pool tables, table tennis tables and vending machines. It can be used by all Charles Morris Hall residents. 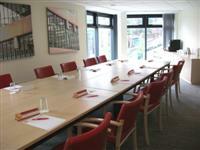 Photograph 2 shows the meeting room, located at the far end of the common room. 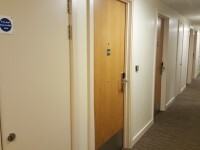 On the 6th floor of the West Wing the corridor leading to rooms 6.16 - 6.51 are all accessed via automatic doors with push pads. 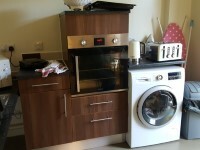 Kitchen K6.6 is also accessed via automatic door with key fob access. You are on Kitchen 6.6. Skip to the next section. The kitchen is located on the 6th floor of the West Wing, in the right hand corridor as you exit the lift. The door to the kitchen opens automatically away from you. The door is opened by key fob. The height of the key fob reader is 106cm. The door is 89cm wide. There is a push pad to exit the kitchen. 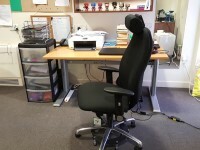 The height of the push pad is 84cm. 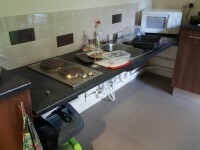 There are standard height counters and a lowered counter. 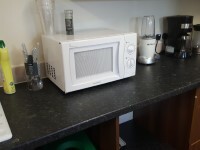 The lowered counter is 70cm high. 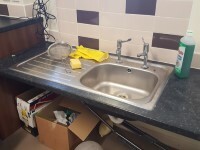 The lowered counter has a sink and hob. The sink has separate hot and cold taps. The taps are lever taps. 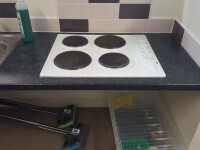 The height of the top control on the lowered hob is 73. 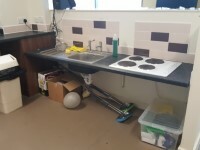 The height of the sink is 92cm. The sink has separate twist and turn taps. The height of the top control is 95cm. The cooker control is 93cm. The height of the top control is 80cm high. There is a tumble drier. The height of the top control is 80cm. The height to the top control is 112cm. The height to the handle is 84cm. 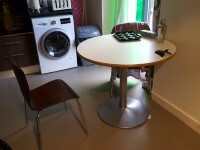 The height of the lowest table is 38cm. The height of the highest table is 73cm. 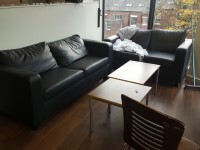 There are 2 two seater sofas with armrests on both ends. You are on Other Floors (East Block). Skip to the next section. The floors which are accessible by stairs are levels 1, 2, 3, 4, 5, 6, 7 and 8. 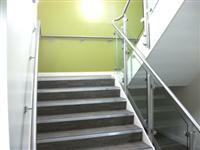 These stairs are located just off the main reception foyer. There are also stairs available on the far side of the building, just inside the level 1 entrance. You are on Lift (East Block Main Lifts). Skip to the next section. The lift is located opposite the main entrance. 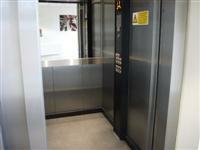 The floors which are accessible by this lift are levels 1, 2, 3, 4, 5, 6, 7 and 8. The dimensions of the lift are 96cm x 138cm (3ft 2in x 4ft 6in). 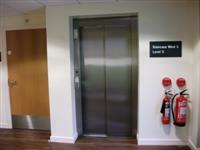 These lifts are also 4 metres from the reception rear entrance on level 2. There is an easy ramp in front of the lifts on all levels. There are also lifts available on the far side of the block, just inside the level 1 entrance. You are on Other Floors (West Block). Skip to the next section. The floors which are accessible by stairs are levels 2, 3, 4, 5, 6, 7 and 8. The details here are for the stairs just inside the West 3 entrance. There are similar stairs just inside West 1 and 2 entrances, except these do not access level 2. You are on Lift (West Block). Skip to the next section. The lift is located just inside West 3 entrance. The floors which are accessible by this lift are levels 2, 3, 4, 5, 6, 7 and 8. The lift is approximately 3m (3yd 10in) from the West 3 entrance. The dimensions of the lift are 107cm x 138cm (3ft 6in x 4ft 6in). There is a similar lift just inside West 1 entrance, except it does not access level 2. 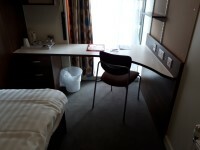 You are on Accommodation (Access Exceptional Accommodation). Skip to the next section. The room number viewed was East 2:10 and East 2:12. The width of the door to the room is 84cm (2ft 9in). 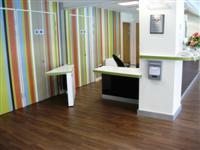 The dimensions of the clear floor space are 250cm x 620cm (8ft 2in x 20ft 4in). 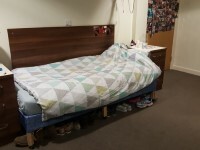 The bed is 58cm (1ft 11in) high. 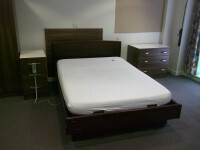 The measurement between the bed base and floor is 22cm (9in). 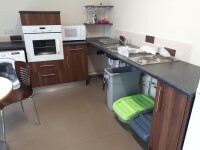 Other accessible facilities available in the bedroom are automatic room and ensuite doors, a kitchen area with accessible surfaces, sink, hob and oven, an accessible wardrobe and automatic window openers. 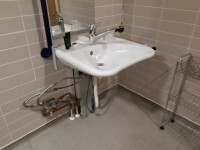 Other accessible facilities available in the accommodation are automatic doors in the corridors leading to the room and an adjoining room. The dimensions of the bathroom are 248cm x 304cm (8ft 2in x 9ft 12in). The width of the door to the bathroom is 85cm (2ft 9in). The measurement of lateral transfer space is 118cm (3ft 10in). There is not a dropdown rail on the transfer side. 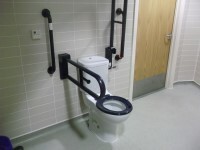 Wall mounted grab rails are not available for the toilet. 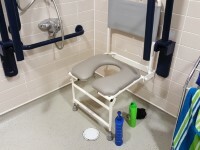 The shower seat is flip-down. 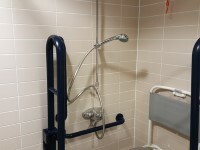 There are handrails available for the shower. The colour contrast between the walls and floor in the bathroom is fair. 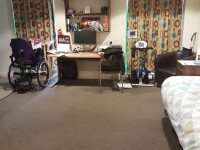 There are 3 types of adapted room available within Storm Jameson Court. 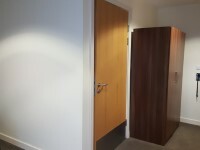 The details here are for an Access Exceptional Room, for residents who require hoists and an adjoining room for a carer. There is also an Access Exceptional room available in East Block (room 212). 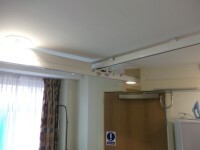 The ceiling track hoist covers all of the bedroom and ensuite, but not the kitchen area. 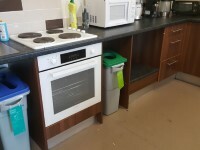 Disposal facilities can be made available on request. 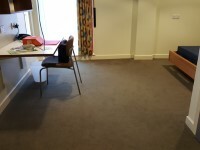 Photographs 9, 10, 11 and 12 show the adjoining room. 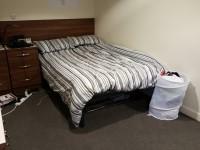 You are on Accommodation (M3 Studio Accommodation). Skip to the next section. 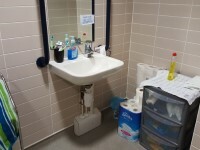 The establishment provides 21 accessible accommodation facilities with an ensuite and/or separate accessible bathroom. The room number viewed was East 6.07. The dimensions of the clear floor space are 260cm x 400cm (8ft 6in x 13ft 1in). 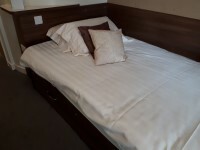 The bed is 57cm (1ft 10in) high. 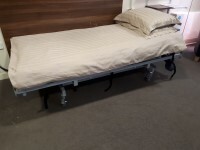 The measurement between the bed base and floor is 27cm (11in). 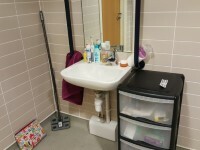 Other accessible facilities available in the bedroom are an automatic room door, a kitchen with lowered and accessible surfaces and an accessible wardrobe. 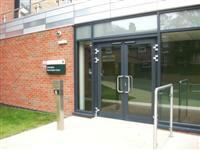 Other accessible facilities available in the accommodation are automatic doors in the corridors leading to the room. 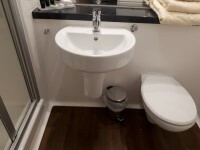 The dimensions of the bathroom are 246cm x 32cm (8ft 1in x 1ft 1in). The measurement of lateral transfer space is 114cm (3ft 9in). 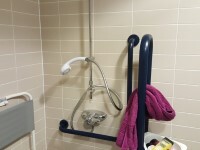 There is / are 23 accessible room(s) with a wheel in shower. 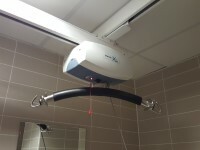 M3 rooms have ceiling track hoists or ceiling stubs so that hoists can be fitted on request to cover the room and the ensuite. 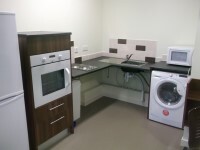 There are 3 other M3 rooms located in East Block, all of which are studios containing accessible kitchen areas. 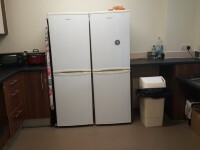 There are 5 M3 rooms located in West Block, which will use the shared kitchen areas. 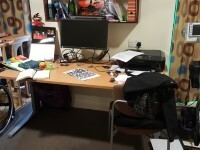 There are also a further 12 M2 rooms available throughout both blocks. These are similar to M3, except they do not have provisions to add hoists. 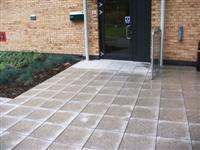 A resident or visitor wishing to bring an assistance dog into this building needs to contact the Accommodation Office. You are on Accommodation (Room 5.11). Skip to the next section. 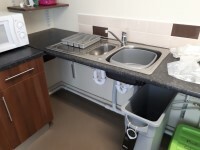 The establishment provides 14 accessible accommodation facilities with an ensuite and/or separate accessible bathroom. This information refers to Room 5.11. The accessible facilities are located on the fifth floor, of the west wing. The room number viewed was 5.11. The dimensions of the clear floor space are 370cm x 250cm (12ft 2in x 8ft 2in). The bed is 53cm (1ft 9in) high. 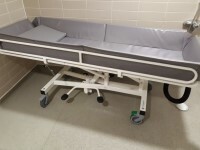 The measurement between the bed base and floor is 20cm (8in). The dimensions of the bathroom are 298cm x 245cm (9ft 9in x 8ft). 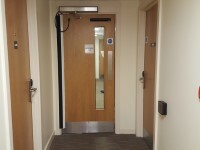 The measurement of lateral transfer space is 161cm (5ft 3in). 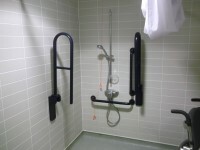 There is / are 14 accessible room(s) with a wheel in shower. There is a kitchen in this room, with height adjustable counters. The sink has a lever mixer tap. The height to the top control of the cooker is 118cm. 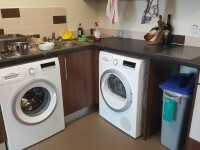 The height to the top control of the washer/drier is 81cm. 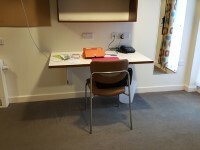 You are on Accommodation (Room 6.30). Skip to the next section. This information refers to Room 6.30. 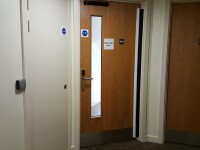 The accessible facilities are located on the 6th floor of the west wing. The room number viewed was 6.30. The dimensions of the clear floor space are 206cm x 350cm (6ft 9in x 11ft 6in). The bed is 51cm (1ft 8in) high. 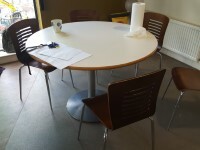 Other accessible facilities available in the accommodation are automatic (away from you) door, key fob (108cm) to enter, height adjustable desk, push pad to exit (84cm), lowered handle for blinds. 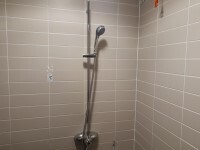 The dimensions of the bathroom are 260cm x 250cm (8ft 6in x 8ft 2in). The measurement of lateral transfer space is 168cm (5ft 6in). 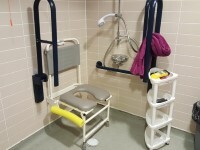 The shower seat height is 49cm (1ft 7in). The ensuite has an automatic door. The height of the push pad is 84cm to enter, 90cm to exit. The door is 85cm wide. The transfer space for the ensuite toilet is both sides. The transfer space on the left (as you face the toilet) is 101cm. You are on Accommodation (Room 7.30). Skip to the next section. This information refers to Room 7.30. 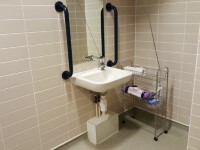 The accessible facilities are located on the 7th floor of the West Wing. The room number viewed was 7.30. The dimensions of the clear floor space are 263cm x 375cm (8ft 8in x 12ft 4in). The bed is 45cm (1ft 6in) high. The measurement between the bed base and floor is 15cm (6in). 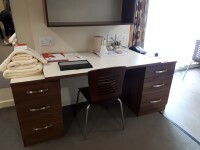 Other accessible facilities available in the bedroom are height adjustable desk, lowered handle blinds and adjustable height bed. 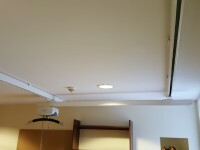 Other accessible facilities available in the accommodation are ceiling tracking hoist. The dimensions of the bathroom are 258cm x 245cm (8ft 6in x 8ft). The width of the door to the bathroom is 89cm (2ft 11in). The measurement of lateral transfer space is 163cm (5ft 4in). 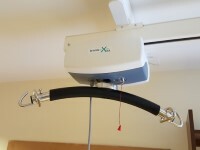 Available mobility auxiliary aids include mobile hoists and ceiling tracking hoists are available. You are on Accessible Toilet (East Block). Skip to the next section. 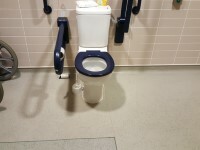 The accessible toilet is 40m (44yd) from the main entrance. 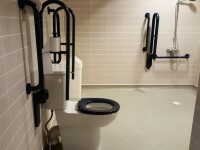 The accessible toilet is located on level 3, on the far side of the common room, next to the entrance to the ground floor rooms. 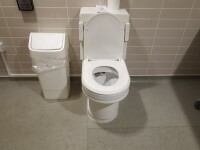 There is an identical toilet on level 2, just inside the reception rear entrance, and a similar toilet just inside the entrance on level 1, although this has a larger cubicle (shown in photograph 2). You are on Standard Toilet(s) (East Block). Skip to the next section. 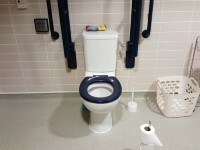 The female and male toilet facilities that were surveyed are located by the accessible toilet, past the common room. The female and male toilets are approximately 38m (41yd 1ft) from the main entrance. 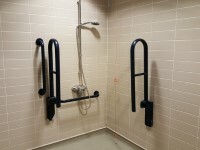 These toilets contain ambulant cubicles with doors that open outwards and have grab rails fitted. You are on Accessible Toilet (West Block). Skip to the next section. 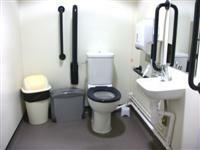 The accessible toilet is 5m (16ft 5in) from the West 3 entrance. 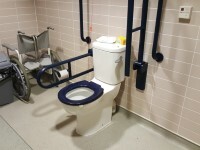 The accessible toilet is located just inside West 3 entrance, next to the lift. 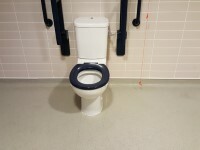 The dimensions of the accessible toilet are 147cm x 216cm (4ft 10in x 7ft 1in). 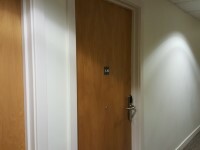 There is also a toilet just inside West 1 entrance, except this has the transfer space on the right (shown in photograph 2).